Granite scares away many stone restoration contractors, but it is mainstream for CENTURY STONE. This hard surface is a perfect selection for high wear commercial floors, and kitchen counters. Whether you are seeking to restore your granite floor, removing a scratch, or polishing out a dull spot, CENTURY STONE can deliver the finish you are seeking. With granite counters or floors, CENTURY STONE can assist you in caring and restoring your surfaces. GRANITE REPAIRED, POLISHED, AND RESTORED TO LIKE NEW! Imagine your water-stained, chipped granite revitalized to its original, elegant state. Century Stone Sealing and Resurfacing will restore any granite surface that has become dull, scratched, chipped, or otherwise damaged. Granite Polishing / Wear Removal – Dull spots by the doors, in the elevators or in your high traffic areas? CENTURY STONE can restore a smooth, new, beautiful appearance, again. Polishing is done using high speed diamond technology optimized for granite restoration. Talk to the company that has restored more granite floors and has maintained high traffic granite floors without the need for additional restoration for more than 15 years and counting. Granite Floor Scratch Removal – Have a scratch? Someone pull a heavy object across your floor? Concerned that the repair might dip your floor? Talk to CENTURY STONE, we can remove scratch damage and feather the floor to blend the finish without dipping the floor or counter. Granite Floor Maintenance – While many companies will not work on granite, CENTURY STONE relishes the opportunity. We not only work with granite, we can maintain your high traffic granite surfaces in a manner that enables us to guarantee that if we are maintaining your floor monthly you will NEVER have to restore it again. 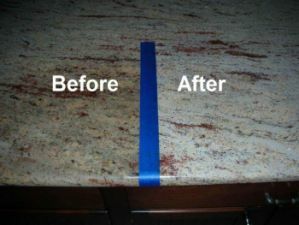 Need to restore that beautiful finish you had when your granite countertops were first installed? Granite is a very hard and very durable surface, but improper cleaning products among other things can diminish that pristine finish over time. Call CENTURY STONE and let us make you smile again. We use our own proprietary sealers to give your granite a shield of protection to inhibit stains of all kinds.